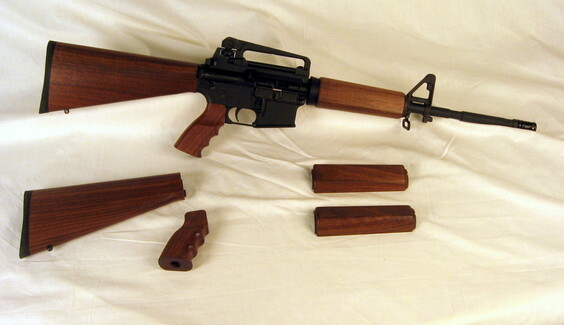 The complete AR-15 wood stock set includes the buttstock, pistol grip, and hand guard. All bolts needed to assemble onto your rifle are included. All parts are made of premium grade American Black Walnut. Each part is finished with a traditional hand-rubbed oil finish. The Mid-Length set is identical to the 12" Rifle set except that it is made shorter to fit the standard mid-length barrel. A complete stock set for the Carbine is also available. This set includes a hand guard made to fit the standard carbine rifle. We offer two hand guard versions -- a standard round model and a traditional triangular model. See below. The pistol grip is ergonomically shaped to give you a more comfortable feel. 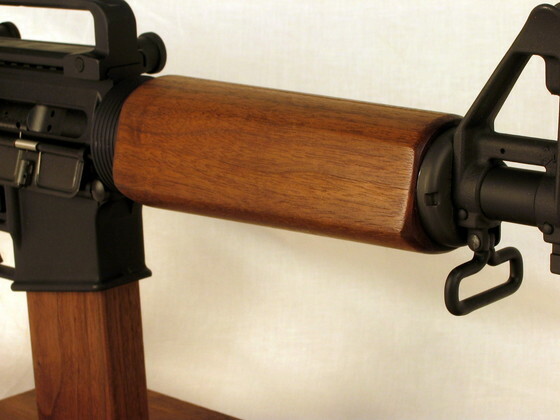 The buttstock mounts over the A2 style buffer tube with standard spacer. A high quality rubber kick plate with steel insert is already ground to fit the buttstock by our gunsmith. At this time we offer four different hand guards in three different lengths: 12" rifle length, mid-length, and carbine length. The 12" rifle length and mid-length fit between the standard triangular cap on the front and the D-ring on the rear. We have two Carbine length hand guards (see pictures below). Both fit between the standard round cap on the front and the D-ring on the rear. 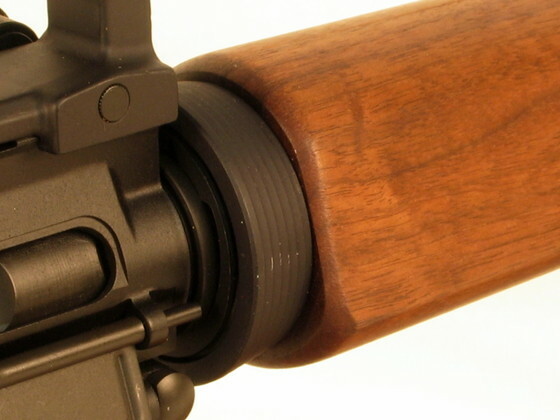 Front view of the Standard Round Carbine Hand Guard. Note the round cup. Front view of the Carbine Length Triangular Hand Guard. Note the Round cup.